After four years of planning, fundraising and hard work, it’s official: Bowie has the Guinness World Record for the Largest Bowie Knife. The Bowie Chamber of Commerce received its certification this past week, and will celebrate it with a ceremony at the site in Pelham Park at 2 p.m. June 8. The certificate will be unveiled, and refreshments will be served to mark the occasion. 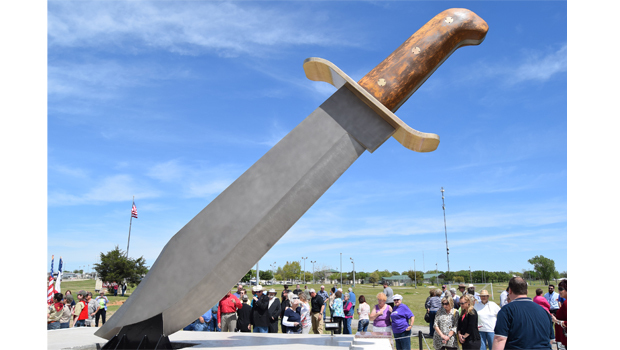 Bryan Brown, co-chair of the Bowie Knife committee, said while the unveiling last April was the biggest highlight so far, the official designation by Guinness puts the final sharp edge on the blade. He looks forward to the next phase as the knife is promoted with its new title. It doesn’t count if you don’t say how big it is.